Inverto is a leader in single cable solutions since 2005, and a major supplier of ODU products to tier-1 satellite operators across the world. Unicable II™ is the 2nd generation of Inverto’s single cable distribution product range and is based on digital Channel Stacking technology (dCSS). Contrary to other suppliers who rely on the silicon vendors to provide the software, Inverto’s R&D team has full control over the development of the software and hardware of its Unicable II LNB and Multiswitch products. This allows Inverto to develop and add unique hardware and software features to its products and benefits customers from its ability to quickly customize the product and offer solutions that address their unique requirements. LNB and Multiswitch Solutions based on BRCM, MXL and ENTR dCSS ICs and support either DYNAMIC mode (EN50607) or STATIC mode (a fixed grid of TP frequencies translated to IF frequencies). Operating characteristics (eg dynamic/static mode, channel bandwidth/frequency, output power level etc.) are all programmable and can be configured and updated in the field using Inverto’s programming device , PC software tools and mobile applications. The products can be powered over a connected STB or by an AC/DC adapter over a power inserter in case the STB is unable to provide the necessary power. Software-based product configuration providing upgradable future-proof solutions and greater flexibility to address various installation scenarios. Quick and simple upgrade of subscribers’ homes from single-tuner single-room setup to multi-room multi-tuner setup (up to 32 tuners in total) using existing cables, reducing cost and time of upgrades. Programmable Static Mapping mode distributing up to 32 Transponders in SDU/MDU to unlimited number of receivers, reducing the number of cables and saving expensive multiswitches. Fully compliant with both EN50494 and the latest EN50607 standards. Software fully controlled by Inverto allowing to develop unique features and support operators and other customers to address their unique requirements. The configuration of Unicable2 ODU products is software-based. Inverto’s Programmer allows users to modify and update product configuration according to the needs of their specific setup in the field. An intuitive PC Windows application is provided together with the Programmer device allowing to customize product configuration and operating parameters eg UB frequencies and BW, Output power level, Operating mode (ie Static or Dynamic) and more. NEW! Programmer with Bluetooth interface and iOS/Android apps. 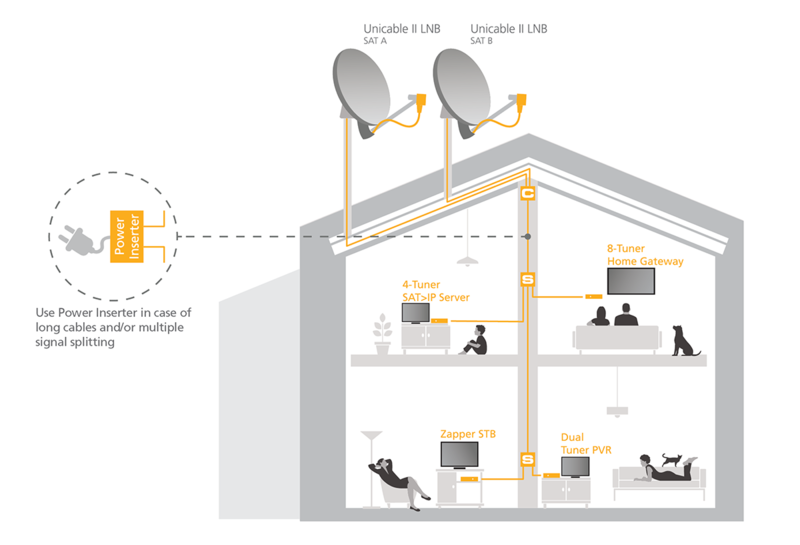 Single household installation in dynamic mode – multi-tuner STBs (up to 32 tuners) connected over a single coax cable drop from the rooftop. 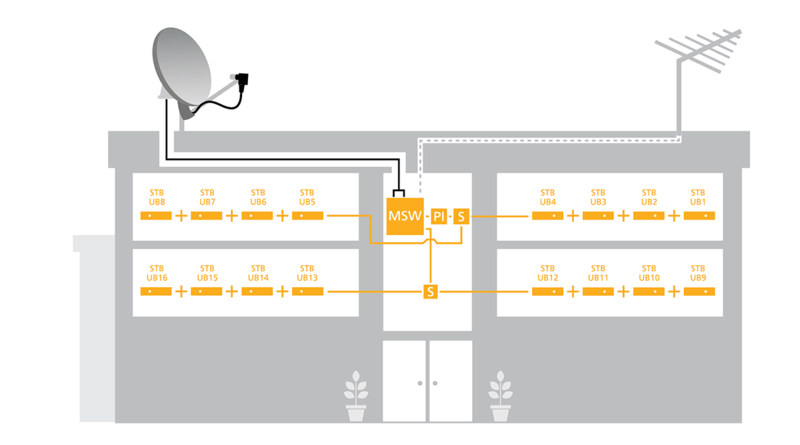 MDU/Hospitality installation in static mode – distribution of up to 32 TPs to any number of STBs connected over a single coax cable drop from the rooftop. Upgrading existing MDU installations – dCSS multiswitches with up to 32 UBs in dynamic mode supporting multi-room or multi-tuner installations in apartments with a single coax cable drop. Dynamic: Up to 32 STBs/tuners connected over a single coax can each access any number of TPs available on the received satellite. The STBs shall comply with EN50494/EN50607. Example: Total 120 TPs transmitted from the Satellite. Any of the 120 TPs can be received by each of the up to 32 STBs/tuners connected in the house. Static: Up to 32 TPs can be received by any number of STBs connected over a single coax. Example: A DTH Operator providing its service over 32 TPs. Any number of STBs (Legacy or Unicable) can be connected over a single coax drop , each having access to each of the 32 TPs. SDU with two satellite dishes, each mounted with a Unicable II LNB. The outputs of the LNBs are connected to a single output combiner and one cable enters into the house. Inside the house, the cable drop is split with unicable splitters to connect up to 32 tuners eg 2-tuner PVRs + 4-tuner SAT-IP Server + several zappers. A hotel offering a 30 TP bouquet from two satellites. 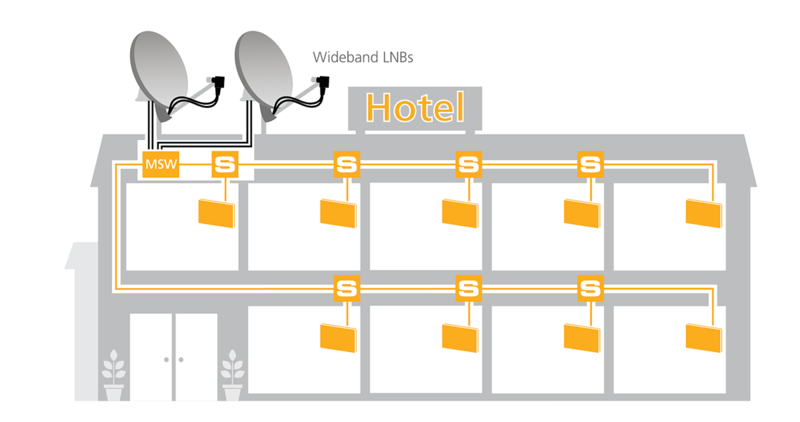 There are two satellite dishes, each with a wideband LNB, the LNBs are connected to a dual output Unicable II switch feeding each floor with a single cable drop. The TV bouquet is distributed to each room through common Unicable splitters. The Unicable II multiswitch (item 5294) is backward compatible provides for a cost effective distribution of satellite TV to first-generation Unicable I STBs. 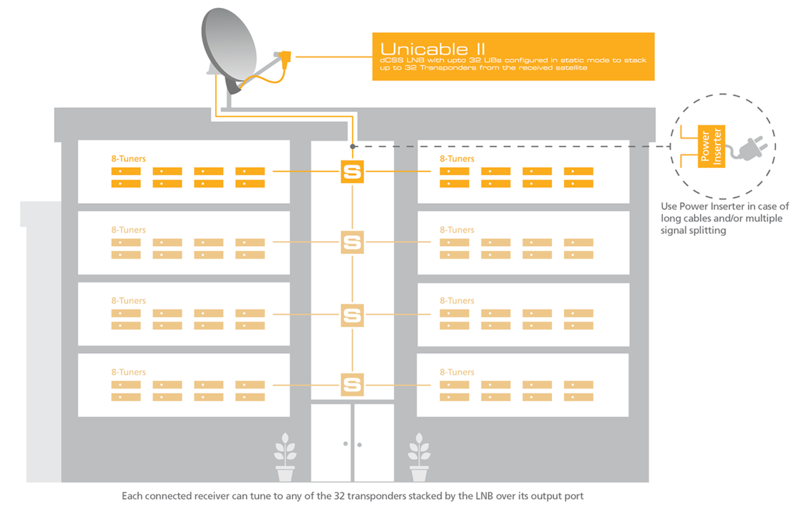 The Unicable I standard (EN50494) supports up to 8 UBs and with the two output ports of the Unicable II multiswitch, up to 16 Unicable I STBs can be connected. In this way, existing older generation receivers can be utilized while the distribution infrastructure is future proof. Setup/installation OSD menu (eg add a new type of LNB + select UBs for the STB). The STB sw should support EN50607 (for channel change, channel search, etc.). Use extended IF frequency range (require full-band capture tuners at the STB). Signal distribution elements (eg splitters, combiners) shall support DC + DiSEqC pass to the LNB. Ability to update the LNB f/w (optional). Power supply supported by the STBs. Ability to broadcast new TP list (eg to support adding new / changing existing TPs). Ability to update the LNB configuration from the STB over the coax. Signal distribution elements (eg splitters, amplifiers) shall support DC pass to the LNB (optionally DiSEqC pass for configuration update).